A brief history of Cobb & Co - the Company's Beginnings, Changing Hands, going from strength to strength, Cobb & Co factories and finally the end of an era. 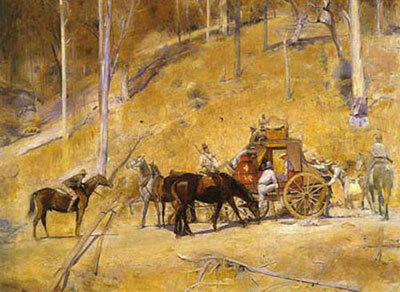 Henry Lawson (1867-1922) was a short story writer and poet born at Grenfell New South Wales. Lawson was among the best known Australian poets and fiction writers of the colonial period. Down through the ages drifts the story of courage and ambition. Young entrepreneurs who became legends in their own time becoming drivers of the 'ship of the plains'. Warren-Nevertire, Orange, Nyngan, Bourke and Bathurst. encourages research and identification of Cobb & Co roads, inns and changing stations whilst capturing the social history of the era with the stories of coach drivers, grooms, innkeepers, booking office managers and passengers. The Cobb & Co Heritage Trail does more than record the past - it entices the individual to explore the countryside, learn the legend, appreciate the history and enjoy the area as it is today.